We are so lucky at home, a hedgehog came to visit us often, almost every night this summer, and once we saw her with her two little ‘hoglets’. Really though it is a great shame that we are “lucky” to be regularly visited by this lovely little creature. Why ? Because Hedgehogs, like our Bumble Bees, are declining so rapidly they could soon be a rare sight! We are so lucky as surveys show that sites where hedgehogs have been seen have declined by 40% in 10 years, and their actual numbers have gone down by over 66% in the last 13! I’m not good at maths, but can you guess how many of these lovely little creatures will be around after another 13 years ? And it is so easy to do a lot. Make sure they can roam around freely; we have deliberately taken out several bottom fence panels to enable free ‘ambling’. Let your garden have some ‘Wild Side’. Manicured lawns may be lovely for cucumber sandwiches, but birds, butterflies, hedgehogs and so many other creatures like it a bit ‘rough’. 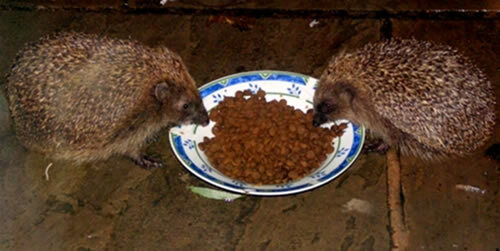 Keep them coming after they have scoffed all your slugs by offering fresh water and food. 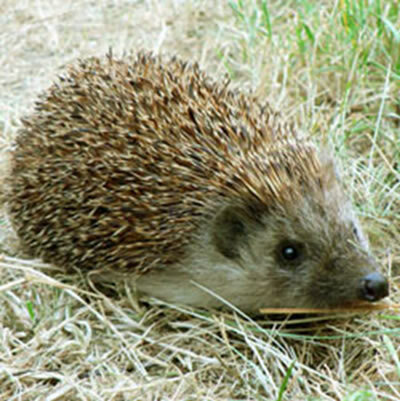 Meaty pet food, meal worms and sunflower seeds are great – in fact our hedgehog cleans up all the sunflower seeds the birds have sprayed about. Go easy on the chemicals, particularly pesticides, and please slug pellets should be a definite NO! Nosy little creatures hedgehogs, but they can’t see very well, so keeping holes, drains ponds and stuff covered (or at least offer an easy way out) is a good idea. Check any plastic netting you have over raised beds and things, it can be a deadly tangle for lots of little creatures. 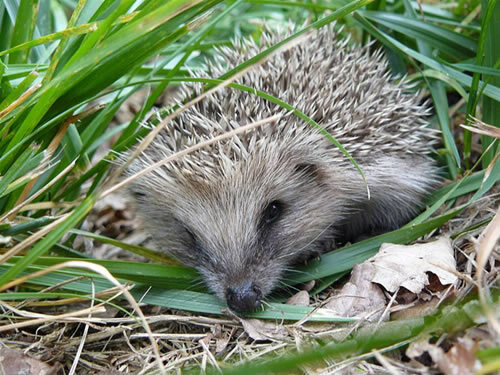 That pile of leaves, the compost heap (Joe’s joy), long grass, piles of cuttings, all sorts of places are cosy nooks for Hedgehogs – so be careful about forking, turning and cutting. 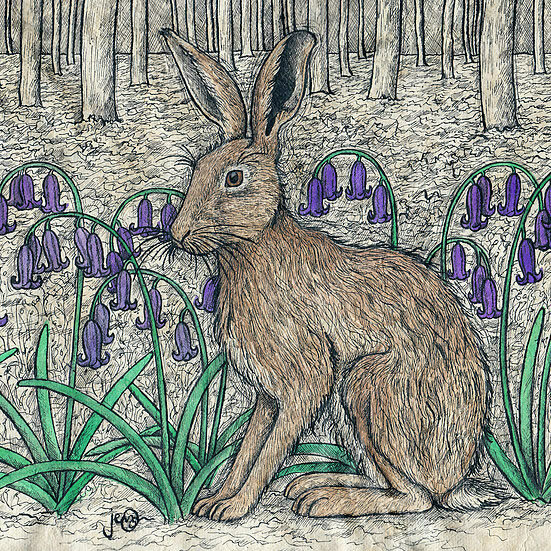 And please, please check that heap you are about to burn – can you think of a worse fate for any creature ? That, at last you say, gets me on to Hedgehog Homes! Well we have had some handmade to suit even the most discerning Hedgehog. Nothing fancy mind, no turrets or pretend windows, just carefully made from good 2 cm thick FSC pine, raised by batons off the damp ground. It has an entrance chamber, and a separate sleeping area protected from draughts, and cat’s paws, by a central wall. Interior dimensions of each chamber is about 29cm by 12 cm wide. 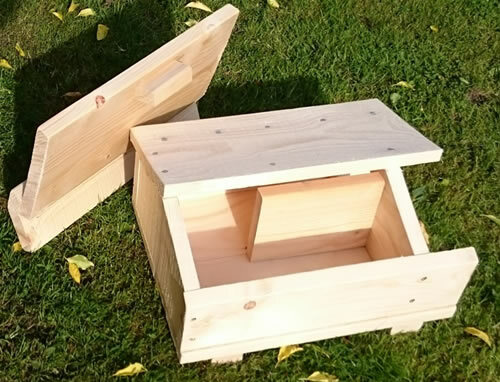 A solid, secure home where you can remove the lid over the sleeping chamber to give a bit of a Spring clean. We even offer a couple of free of charge ‘extras’. One is some highly desirable fitted coir carpet in the bedroom. Or a sachet of our totally non toxic Lifetime Wood Treatment. Just let me know when you order if you would like either, or both, options. 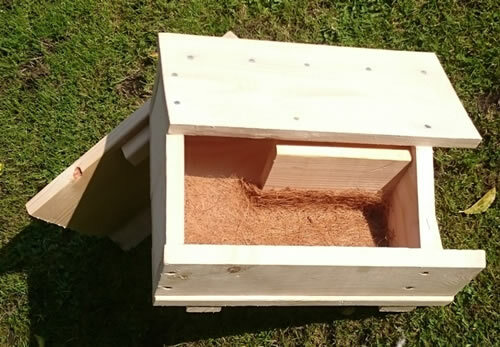 We are really proud of our no nonsense ‘Hedgehog Houses’, we have put two in our garden and covered with 60cm Mulch Mats plus some grass cuttings so all will blend in scruffy old Nature’s landscape. and they both need secure, warm shelter. Then neither will have to travel far from our garden in the Spring which is (a very careful) “Party Time”! 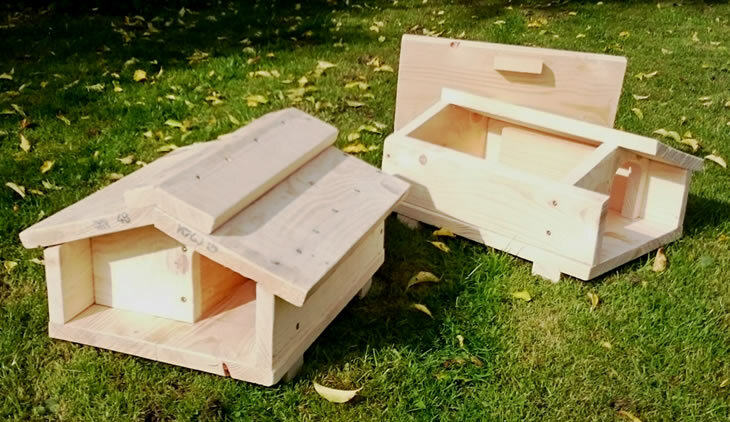 We ask you to contribute towards carriage though, chipping in £8.50 for either one or two Hedgehog Houses.